People are flocking to visit the statue of Saint Teresa on view in Dag Hammarskjold Plaza as the UN General Assembly convenes its 71st Session on Sept. 13. 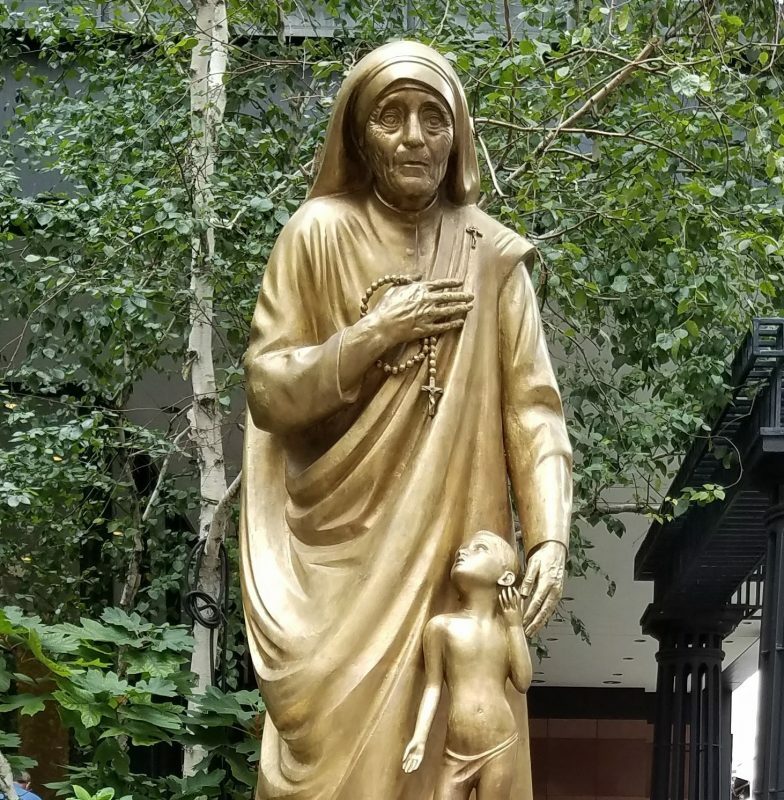 The statue was first unveiled in Battery Park where crowds turned out on Sept. 4 to celebrate the canonization by Pope Francis of the world-famous “Mother Teresa of Calcutta” with a simulcast of the canonization mass. The statue was blessed by Bishop Gerald Waslh, vicar general of the Archdiocese of New York. At the UN, an exhibition culminating in a conference on Sept. 9 celebrated her works. Saint Teresa, who won the Nobel Peace Prize in 1979, is probably the most famous Albanian in the world, and the occasion brought out New York’s Albanian community in full force. Assemblyman Mark Gjonaj, a Bronx Democrat of Albanian descent, organized the Battery Park event. Dancing-with-the-Stars hoofer Tony Dovolani (“born and raised in Pristina”) emceed portions of the program, which included Albanian dancing and singing. “Life can only be measured by how much love you share,” Dovolani said. Born Anjeze Gonxhe Bojaxhiu in Skopje (then part of Kosovo, Vilayet), she founded the Missionaries of Charity, which required adherents to give “wholehearted free service to the poorest of poor.” Her life was devoted to helping suffering, impoverished people around the globe.